The Progress-Focused Approach: "We must make clear agreements!" "We must make clear agreements!" Sometimes I am asked to facilitate a team meeting which has the purpose of establishing some clear agreements and rules. Such agreements and rules may refer to things like attending meetings, being on time in meetings, submitting time sheets timely, and timely and properly doing what you have agreed to do. When I am asked such questions, there often have been previous attempts within such organizations to establish agreements and rules and attempts to ensure compliance to them but these attempts have usually not worked satisfactorily. The question I am asked is how they can now, for once and for all, make some clear agreements and rules that will be complied with. It is an understandable question but will it work? What I sometimes see is that when people within an organization focus strongly on establishing clear agreements and rules they do not achieve what they ultimately want to achieve. 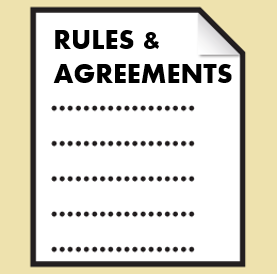 It often seems as if the agreements and rules have become the goal instead of what lies behind the agreements and rules which is what they originally wanted to achieve through the agreements and rules. The risk of a strong (strict) focus on agreements and rules is that you make the motivation of employees more extrinsic and controlled. This may lead to the situation in which people will only do what is minimally required or in which they will even cheat in order to only seemingly comply with the rules. An alternative approach is to not focus primarily on rules and agreements (these are at best means to an end) but on the desired situation. What are we trying to accomplish, why is that important and what different ways can we think of to make progress in that direction? What progress have we already made in that direction? What were some past successes? What has worked well? What useful ideas come to mind when we think about these things? What I often find is that such a way of working can yield some more creative ideas that are more motivating and useful than making a list of agreements and rules. What if your interest fades or is absent?